Platycerium bifurcatum or "staghorn fern" is native to Australia, New Caledonia, New Guinea and Indonesia. They are epiphytic ferns and are usually grown on weathered hardwood or slabs of bark or in hanging baskets. There are 2 kinds of fronds: sterile fronds are flat, pale green turning tan with age: fertile fronds are pale green, forked and resemble deer antlers. Culture: Platycerium bifurcatum need bright indirect light. We grow ours under 52% shade all year long. We use a mix of sphagnum moss and bark to attach the ferns to weathered redwood. Taking a double handful of the mixture and placing it in the middle of the redwood do this. A fresh division of fern is placed over the mixture. Chicken wire is used to hold the fern and mixture in place. The division is watered daily until new growth begins. Once the new growth starts, water is given about every 3 days and fertilized on a weekly basis with a balanced fertilizer diluted to ½ the strength recommended on the label. New divisions should be misted daily to keep the humidity levels high. Once they are established, the ferns are fairly drought tolerant and should be watered at least twice a week during the growing season. Fertilize on a monthly basis for established ferns. During the winter rest period, water only enough to keep the fronds from wilting. Too much water in winter causes spotting of the fronds. 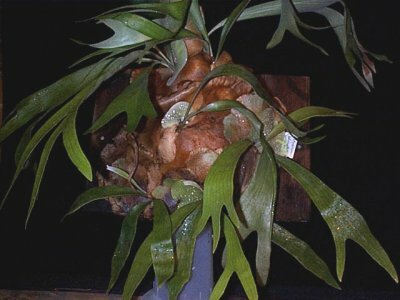 Platycerium bifurcatum was featured as Plant of the Week March 14-23, 2001.